The giant elliptical galaxy Centaurus A shows a split personality because it hides a gaseous spiral at its core. When Centaurus A collided with a spiral galaxy 300 million years ago, it slurped up the spiral's gases, which formed a new spiral inside the larger galaxy. Image released Oct. 22, 2012. An oddball elliptical galaxy is hiding an inner spiral, astronomers have found. The discovery goes against the norm of most big galaxies, which generally fall into one of two categories: spirals and ellipticals. The nearby galaxy Centaurus A seems to be a bit of both. Pinwheel-shaped spirals, such as our own Milky Way, are younger on average, while blob-shape elliptical galaxies are older. "Spirals like the Milky Way are hip and happening places, with plenty of gas and dust to birth new stars," scientists at the Harvard-Smithsonian Center for Astrophysics (CfA) in Cambridge, Mass., said in a statement. "Ellipticals are like cosmic retirement villages, full of aging residents in the form of red giant stars." Centaurus A is an elliptical galaxy about 12 million light-years away that scientists think gobbled up a spiral galaxy about 300 million years ago, as evidenced by a dark dust lane that streaks across its middle. Astronomers led by Daniel Espada of the National Astronomical Observatory of Japan and the CfA used the Smithsonian Astrophysical Observatory's Submillimeter Array telescope to image Centaurus A in radio light, which can pierce through the dust to see signals from carbon monoxide gas within the galaxy. This light showed the telltale signs of two spiral arms buried inside the elliptical galaxy's core. The arms are the same shape and size as typical spiral galaxies' arms, and they appear to be forming new baby stars like those arms do. "No other elliptical galaxy is known to have spiral arms," Espada said in a statement. "Centaurus A may be an old galaxy, but it's still very young at heart." 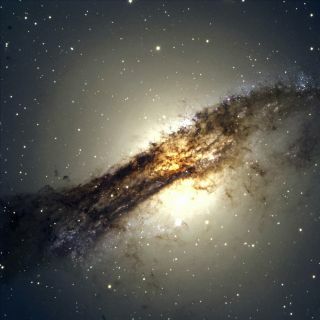 The astronomers hope to find more split-personality galaxies like Centaurus A farther away from us. They plan to use the Atacama Large Millimeter/submillimeter Array (ALMA), a new radio telescope under construction in the Atacama Desert of northern Chile, to continue the hunt. "We definitely will use ALMA to search for other objects that are similar to Centaurus A," Espada said. The discovery is detailed in a paper published recently in The Astrophysical Journal Letters.